This time I’m baking with red wine, I chose Barbera from my favorite winery Castello Di Amorosa. Barbera has aromas of dark fruits so I thought it would be perfect with blackberries. The chocolate cake is super moist because of the wine and the olive oil (you can use other kind of oil if you want), but the olive oil pairs really good with this wine. 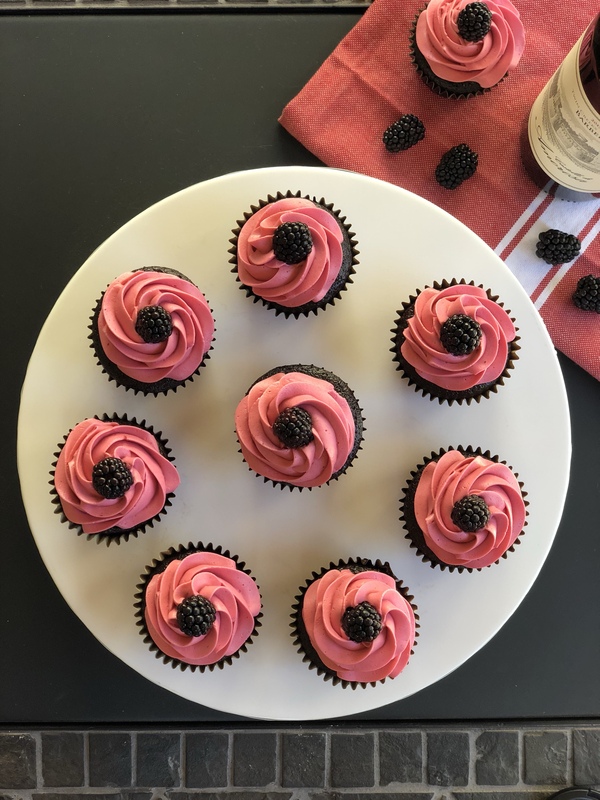 The frosting is a silky blackberry buttercream, really good combination. 1.- Preheat oven to 350°F. Prepare cupcake pan with liners, set aside. 2.- In a large bowl, sift together flour, cocoa powder, brown sugar, granulated sugar, baking soda, salt and cinnamon. Set aside. 3.- In the bowl of a stand mixer fitted with a paddle attachment, mix eggs, buttermilk, olive oil and vanilla extract and mix on medium speed for about a minute until combined. 4.- Add flour mixture to the bowl and combine on low speed, gradually increasing speed to medium, until completely combined. Add wine and beat to combine again for about 1 minute. Pour batter into prepared cupcake liners, filling 2/3 full. Bake for 18-20 minutes, or until a toothpick inserted into the center of a cupcake comes out with a a moist crumb. Let cool in pan for 5 minutes, then transfer to wire rack to cool completely. Be careful with how you handle the cupcakes, if they are still warm they can be soft and they can break. 1.- In a small saucepan over medium heat, add blackberries, sugar and lemon juice, frequently stirring and squishing blackberries. Stir until blackberries are soft, about 10 minutes. Push the mixture through a fine mesh strainer over a small bowl to remove all the seeds. Put the bowl in the fridge so it cools completely. 2.-In the bowl of a stand mixer fitted with the paddle attachment, beat butter until smooth for a couple of minutes. Add 1 cup of powdered sugar, salt and half of the blackberry juice. Mix well until is fluffy. Add 2 tablespoons of the cream (for me 2 tablespoons was enough). Add more powdered sugar, mix well. Taste the buttercream and see if you need more of the blackberry juice, check the texture and flavor. I used almost all the juice. Beat well until completely combined and fluffy. 3.- Frost the cupcakes. I used 1 M Wilton tip. Enjoy!! Don’t forget to grab a glass of wine too. Cheers! 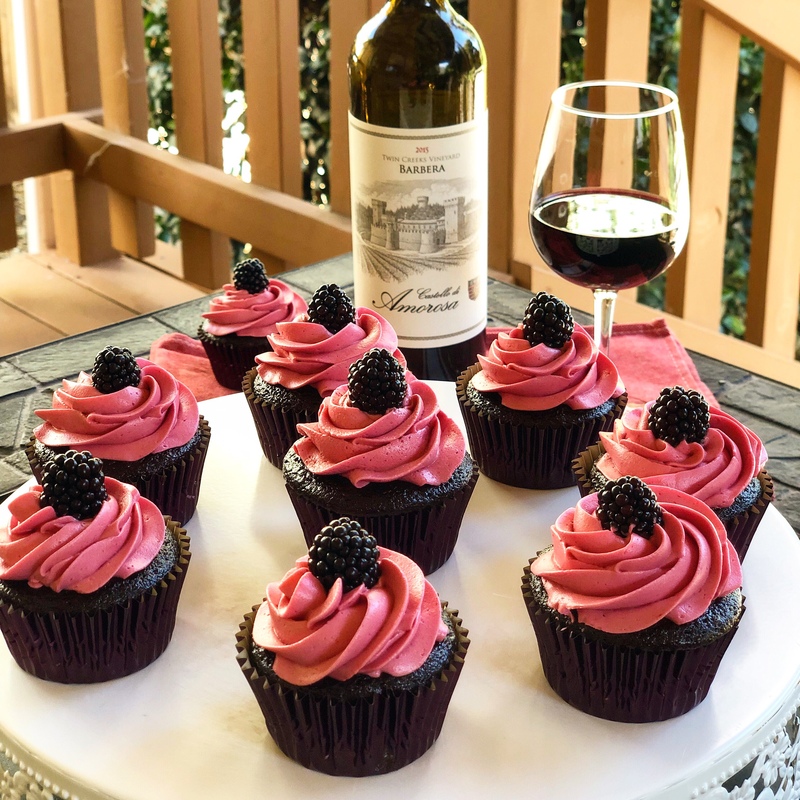 This entry was posted in Recipes and tagged blackberry, cake, chocolate, cupcakes, food blogger, napa valley, recipe, red wine, wine. Thank you Monica! Hope you can try the recipe soon. In love with your BlackBerry frosting, as soon as I get my hands on fresh blackberries I am going to try.. By any chance, will frozen work?